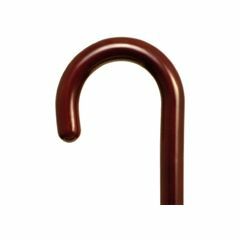 The Rosewood Laminated Wood Cane is a durable cane that offers extra stregnth and support. need handle to be longer. This cane was very light and usable. It looked great in the box and shortened it with a saw to make it shorter. I was impressed that the handle wasn't as long as in the picture and hope that future people have a cane with a longer handle. But anyways it is a good cane and gave it to my friend Dante who really liked it and uses it all the time. Another thing is i thought the cane was a men color and not a lady but it is other people opinion. Thanks for everything.